There certainly is something deeply disturbing about the prospect of another Clinton or Bush presidency, but it has very little to do with the content of the article posted below. However, the title of this Financial Times article was far too accurate to pass up for the real reasons that follow. First, Hillary Clinton, the presumptive Democratic nominee, has shown herself to be completely unfit for public office … any elective office whatsoever. Her gross mismanagement of the Benghazi fiasco will never be sufficiently explained; nor will the stain of her congressional testimony ever be washed away from the public consciousness. Then there is Emailgate, a multi-year series of unparalleled transgressions too long to list here. Any objective look at the facts of this unprecedented scandal reveals that the “Former Secretary of State Effectively and Illegally Operated A Parallel Government”. Also, her continued stonewalling of the House Select Committee which has subpoenaed her email records certainly does not help her candidacy. Going back into her work history reveals that she was ignominiously fired from her job with the House Judiciary Committee’s Watergate investigation; she sought to unlawfully deprive Richard Nixon of legal counsel, which would have been grounds for disbarment had she been somehow successful. Her boss at the time, “Jerry Zeifman, the general counsel and chief of staff of the House Judiciary Committee … called Clinton a “liar” and “an unethical, dishonest lawyer.” And Zeifman was a longtime loyal Democrat. As a self-proclaimed champion of women’s right, Ms. Clinton aggressively acted to squash every woman’s attempt for justice who filed a sexual abuse complaint against her husband, Bill Clinton, a well-known philanderer going back to his dubious days in notoriously seedy Arkansas politics. Each of those women was systematically destroyed by way of the classic Clintonesque politics of personal destruction. Lastly, there are the ‘terrorist’ attacks of 9/11 which occurred during Ms. Clinton’s term as U.S. Senator of New York State. It is the obligation of any U.S. Senator to ferret out the truth concerning such a bold assault on both citizenry and property. Ms. Clinton failed dismally in this regard, as even the members of the official 9/11 Commission indicated very little confidence in the findings of the grossly deficient federal investigation. It appears that she may have even been promoted into her State Department position for her deliberate neglect to pursue 9/11 truth. This list of misgivings about a Hillary Clinton candidacy is by no means exhaustive. Now over to Jeb Bush’s prospects for a ‘refreshing’ presidential candidacy. He has already trotted out his many unpaid foreign policy advisors which represent virtually the identical lineup as his brother’s, George W. These are the same neocon co-conspirators who brought us the ongoing and epic disaster known as the Iraq War, as well as the unlawful invasion of Afghanistan. Not only did this rabidly warmongering cabal of mostly Israeli dual citizens expose the USA and its leadership to an endless list of horrific war crimes, they set the entire Middle East on ablaze for the foreseeable future. Jeb Bush has closely aligned himself with the Democratic position on immigration policy. It has also earned him the moniker of RINO-in-Chief as this major faux pas alone disqualifies him from being taken seriously as a Republican presidential candidate. His many treasonous pronouncements on the subject of illegal aliens are as irrational as they are destructive to the American Republic. No real Republican, conservative or otherwise, takes him seriously for this reason alone. Common Core, a true educational catastrophe if ever there was one, is actually a pet project of Jeb Bush. He seems to wear a Common Core insignia on his shirt sleeve as though it’s a badge of honor, shamelessly promoting a proven teaching program disaster everywhere he goes. One wonders if he and his family are the majority stockholders in companies which materially support the inherently flawed Common Core ‘enterprise’. Then there is the ‘little’ problem with the Bush pedigree and its highly problematic history. The Bush family fortune made by Prescott Bush when he worked for Brown Brothers Harriman, which “acted as a US base for the German industrialist Fritz Thyssen who helped finance Hitler in the 1930s”, has always been a huge dark cloud hanging over the Bush political dynasty. As for Florida Governor Jeb Bush, how did his state become the breeding ground for alleged terrorists learning how to fly in preparation for the 9/11 false flag operation? Obviously Florida’s extremely lax attitude toward immigration policy which permitted terrorists to acquire FL driver licenses, flying lessons and other illegal alien perks all occurred on Jeb’s watch. He’s the man for open borders — north and south, east and west — 24/7. Is his family planning a new 9/11 false flag attack should he miraculously win the 2016 election?! Lastly, there is the little matter of Governor Bush using his office to assist brother George W. Bush to steal the 2000 presidential election. The crime scene known as Tallahassee, Florida was rife with intrigues and machinations of every sort and kind in the wake of that stolen election. Even though his Secretary of State, Katherine Harris, took most of the blame for the outright theft of the presidential office (as did the right-leaning SCOTUS), the entire election debacle occurred under the watchful gaze of a quite willing accomplice Gov. Jeb Bush. Hence, where it concerns either Hillary Clinton or Jeb Bush, how does any prospective presidential candidate possibly deal with all that baggage?! In its early days, the United States was beset by rumours about plots to install a monarchy. Thankfully, in George Washington it had a president who understood the power of precedent. He removed his general’s uniform and gave up power after two terms. Thus was sealed the world’s most enduring republic. 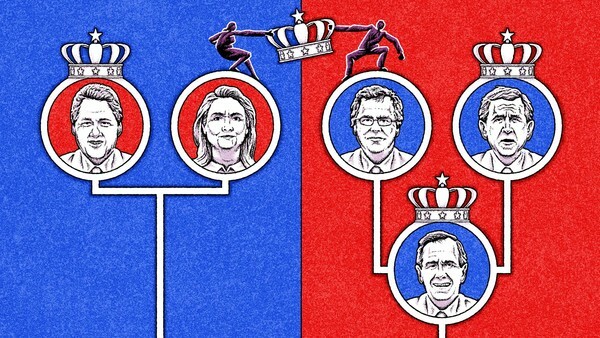 More than 200 years later, the US is bracing for the most dynastic contest in its history. The chances that either Hillary Clinton or Jeb Bush will become its 45th president are high. The country’s elections are far more democratic than in Washington’s day. But there are grounds to worry that America is becoming less of a republic. The odd thing about the prospect of a 2016 “game of thrones” is that Mrs Clinton and Mr Bush would be the two best-qualified candidates to win their party’s nominations. Mrs Clinton has much more experience than any potential rival — and there are not many of those. Having served as secretary of state and twice elected as a US senator, Mrs Clinton would be as fluent in world affairs as any incoming president in recent memory. Only George HW Bush, who had headed the Central Intelligence Agency and served as vice-president, would have been better versed. Many fear the upcoming Democratic primaries will be Mrs Clinton’s coronation. That may be so. But she would take it on merit. Jeb Bush faces a far more contentious battle than Mrs Clinton. His chances of winning are lower. But the Republicans almost always opt for the establishment candidate in the end — Mitt Romney in 2012, John McCain in 2008, and, of course, Jeb’s brother, George W Bush in 2000. Mr Bush’s prospects might be weaker if there were other viable moderates in the field. But Chris Christie, governor of New Jersey, is too tainted by a Sopranos reputation for irascibility. As a first term senator in his forties, Marco Rubio of Florida sounds too much like Barack Obama. Mr Bush has twice served as governor of a big state (Florida). Moreover, he is the Republican with the likeliest crossover appeal in a general election. Most of the rest are too conservative. Mr Bush, like Mrs Clinton, would be his party’s most effective nominee. Yet there is something profoundly disturbing about the prospect of another Clinton or Bush presidency. Should either win in 2016, then by the time he or she completed their second term, the US would have had a Bush or a Clinton in the White House for 36 of the previous 44 years. There are inbred autocracies with richer blood circulation than this. Nor would that necessarily be the end of the Bush-Clinton story. Chelsea Clinton has consistently refused to rule out running for elected office. In recent years she has taken an increasingly high-profile role at the family’s philanthropic organisation, the Clinton Foundation . Bright though she clearly is, it is hard to believe she was picked on merit. In an age driven by philanthrocapitalism, Chelsea has inherited a starring role. The Bush story is multi-generational. Jeb Bush’s son, George Prescott Bush, 38, was elected in 2014 as Texas land commissioner — a state wide position that is a springboard for higher office. He takes his middle name from his great-grandfather, who was a US senator. He takes his first name from his grandfather and uncle, who were both US presidents. A couple of weeks ago, George P’s grandmother, Barbara Bush, 89, shed her apparent reluctance to see yet another Bush in the White House: “Our problems are so profound that America needs a leader who can renew the promise of this great nation,” she wrote in a mass email. The former first lady concluded by saying she was launching a financing vehicle called the “Run Jeb Run fund”. It is hard to imagine this happening in another democracy. The other odd aspect of the Bush-Clinton game is that it is new to US presidential democracy (there have been plenty of family businesses at the state level). Among the founding fathers, only John Adams, the second president, had an offspring who ran for the top job — John Quincy Adams (he became the sixth president). Neither Washington, nor Thomas Jefferson, nor James Madison, were followed by namesakes. Among those who shared a name, Franklin Roosevelt (32nd president) was a second cousin of Theodore (26th) whom he met only a few times. Their presidencies were more than 20 years apart. The US won the world’s admiration by often electing men from humble origins. The myth of having been raised in a log cabin was close to reality for Abraham Lincoln, America’s greatest president. He, too, was the last of his family line. Presidents such as Dwight Eisenhower, Richard Nixon, Ronald Reagan, and, of course, Barack Obama, rose up from modest backgrounds. So, indeed, did Bill Clinton. But here is the thing. At a time of rising inequality — and in an era where the rich tend to be hard working — those who do well in today’s US tend to be the offspring of those who do well on merit. They are given every educational advantage. US society is taking on the character of a hereditary meritocracy. It is far preferable to the indolent aristocracy so rightly abhorred in Washington’s day. But in one respect it is more insidious. Those who believe they have succeeded on merit alone are often free of self-doubt. This can blind them to the perceptions of others. If 2016 is indeed to be a Clinton-Bush contest, we should expect a low turnout. Neither Hillary Clinton nor Jeb Bush should even be under consideration for the POTUS candidacy. That they are is perhaps the greatest travesty of American political history. That the 2016 presidential election could pit one political dynastic family against the other tells the world that the USA is no longer a constitutional republic; rather, it is morphing into a constitutional monarchy.